Carlos María Isidro de Borbón. Pretender to the throne of Spain under the name of Carlos V, Madrid-born 29 March 1788 and died in Trieste (Italy) in 1855. Son of Carlos IV, and brother of Fernando VII, was educated under the direction of P. Escio, Cristóbal Bencomo, Vicente Maturana, the Marquis of Santa Cruz and the Duke of the Roca.despues of the events of Aranjuez followed his family to Bayonne. His proclamation, in Bordeaux on 12 may 1808, jointly with the Prince Fernando and Infante Antonio, is published in excerpt from the latest gazetas of Europe, in 1808: it accepted to let the destinies of Spain in the hands of Napoleon. The 29 September 1816 he/she married with María Francisca de ASIS, daughter of Juan VI of Portugal, and then with his other sister María Teresa de Braganza, Princess of Beira. Generalissimo, Grand Cross of San Hermenegildo and San Fernando, Vice President of the Assembly of this latest order, protector of the upper Board of medicine, Vice President of the Supreme War Council and President of the Cámara of war. On 14 March 1820 gave a liberal proclamation (published in the extraordinary Gazette of Madrid and at the General mail in Seville, number 1, March 22, 1820), dictated reportedly fear, titled "long live the King, live nation, live the Constitution".Actually during the three years he/she began to mean his name the opposition closed to all liberalism, and in 1821 it rang for the first time for the King of Spain. He/She was elected to receive and marry by proxy with María Cristina de Borbón, the fourth wife of Fernando VII, which soon was going to dispossess their rights of succession to the Crown, which doesn't have its irony.The tension between the two brothers grew up point, and Carlos autodesterró to Portugal, from where he/she refused to recognize the rights of Isabel II, alleging that he/she had been born before the repeal of the Salic law in the courts of 1789. In 1833 he/she was proclaimed King by his supporters, starting the Carlist War. He/She managed to go from Portugal to France and introduced into Spain, but its presence in the large Carlist barracks was more a hindrance than a help, and this regardless of what the symbol of his presence could mean in the first years of the war. Lost this for objective reasons, with which he/she collaborated the obtuse nature of the pretender, had this to return to France, residing in Bourges. 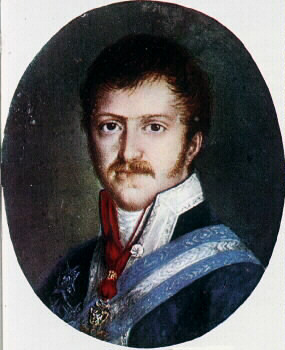 In may 1845, he/she abdicated in his son Carlos Luís, Duke of Montemolín. PAEZ RIOS, Elena: Hispanic iconography. Madrid, 1966. 5 vols.